On our Second day, we thought it would be a good idea to try and check out the Notre Damme again, so we carried out the long 45-minute walk again, arrived and it was closed. We can only laugh about it now, but our poor feet were in agony. We went to the Central Post Office which is huge and located in a fantastic building right next to the Notre Damme. After that, we took a walk back and stopped for lunch and then chilled in a cafe for a little while. We went back to the apartment fairly early so we could chill out and relax before heading off for dinner. We got hungry (doesn’t take long) and went back to the Ben Thanh Food Market for some dinner, as it was our final night in Vietnam we treated ourselves to a rib dish which went down a treat, however as we were sharing it we were still hungry. We got a beef and rice dish afterwards and sat outside whilst there was a band playing. They were really good singers and it was a fantastic way to say goodbye to Vietnam as we chilled with our beers and enjoyed the evenings’ entertainment. 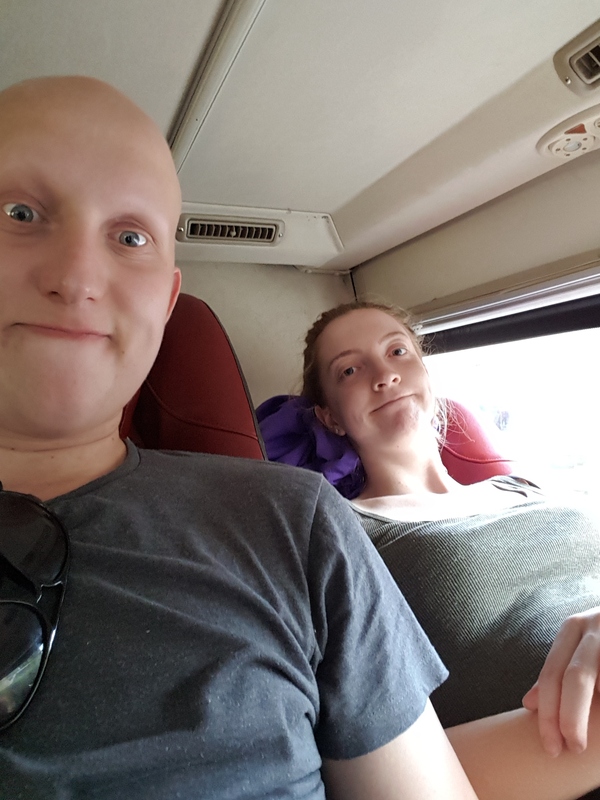 We left Vietnam at around 12:30 pm the next day, got on our bus and began our journey. Our bus journey was, should I say, professional & safe. We had seat belts! They also gave us a bottle of water and even a picnic box. 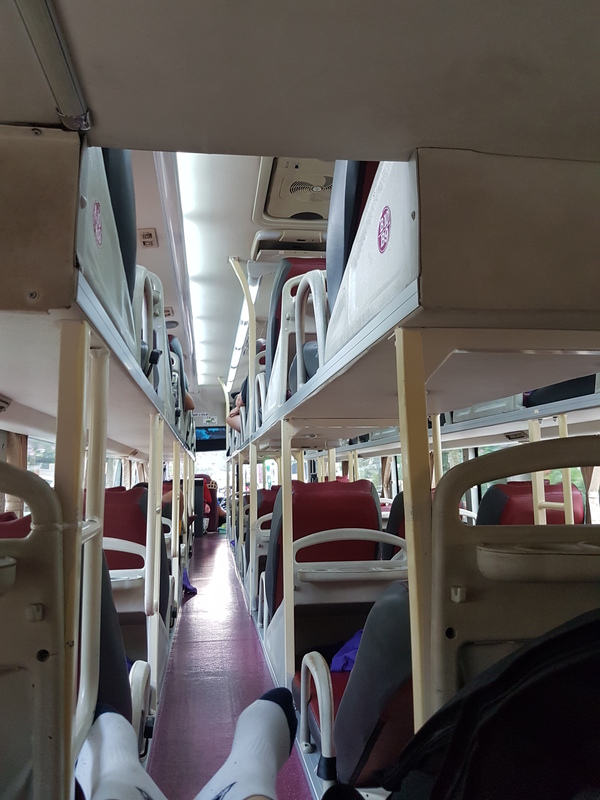 I don’t know if it felt like a luxury because it was, or if it felt like a luxury because of the bus experiences we have had. Regardless it was a comfortable and enjoyable journey taking us only about 7 hours. We went through security and passport control and we were officially through! We arrived at our hotel at about 7:00 pm, put our things in our room and went out to refuel our energy. We travelled from Mui Ne to Ho Chi Minh via train, it was only a 5-hour journey so was a piece of cake for us. After clambering off the train we went and sat in a cafe and had a bite to eat. We booked an apartment via Airbnb and was due to meet the owner at 5 pm. We got to the apartment around 4:45 pm and waited around for him, he arrived on time and took us up to the room, our first impressions were wow! But then we saw the owner go into his room…which was also within our apartment. So basically, we were living like uni students in a flat share. We were too excited by the free usage of a washing machine to care. Admittedly we don’t appreciate back home the luxuries of clean smelling clothes, and I felt old being excited over a washing machine! We emptied our whole bags and did a mass wash taking full advantage of this luxury. The apartment was lovely and we had a kitchen area so we thought we would find a supermarket and cook some dinner ourselves. So after walking 25 minutes we found one, but it was absolutely rammed – it was like Tesco’s on Christmas Eve. The food didn’t work out cheap to buy and was more cost effective to just go out for some dinner, so that was a completely pointless and time-wasted journey. Instead, we stopped off at a street food stop and got some dinner, we then headed back and planned the rest of our days in Ho Chi Minh. Our first full day in Ho Chi Minh was incredible and we survived not getting hit by any mopeds! As the weather was really hot we decided we would get up and out in good timing, we walked 45 minutes to the Notre Damme Basilica??? only to be told that we weren’t allowed in because we were dressed inappropriately as James was wearing a cropped top again. No, but on a serious note our shoulders & knees were on show and to say we were annoyed is an understatement. We walked on towards the War Remnant Museum instead which was about the War between Vietnam and the US between 1955-1975. This was very interesting but incredibly hard to read about. They used a chemical called ‘Agent Orange’ which caused serious defects and unfortunately many people today are still suffering. There was one story about a young girl who had to be locked in a cage all her life because anything she touched she would have the desire to eat – just like a zombie. It was eye opening and made us realise that we were completely unaware of the trauma that everyone had suffered. When we had finished the museum, we took a visit to the Ben Thanh Market where we were able to practice our bartering skills. The market is filled with food, coffee, souvenirs, tailors, clothing, jewellery stalls etc. so anything you want then the world is your oyster if you go there. We moved onto Ben Thanh Food Market and grabbed a bite to eat. If you are travelling to Ho Chi Minh then definitely check out the street food market, it really reminded us of Camden Market in London. There were hundreds of different delicacies to choose from. After feeding our bellies we headed back to sit in a coffee shop for a while – although I’m convinced we only sat in there for the air conditioning! We wandered back to the apartment after finally cooling down, had a nap and then got ready to go out and explore the city at night. We went back to the Ben Thanh Food Market for dinner, we both had a kebab wrap although mine turned to mush as it all just fell apart. We then wandered around to the Backpackers Street which is just a crazy street crammed with bars and clubs. We stopped off for a cocktail and overlooked the crazy Saigon antics. We were hustled by many locals and one was a little boy probably about 12 years old and he was trying to sell us something – the guy who worked at the bar saw and pushed him away as he wouldn’t leave in which the young boy replied with “f*** off”, he got incredibly rude but eventually left. Then we were watching as a young girl around 15/16 put a tin down on the floor, took a gasp of drink (something flammable) and then started fire-breathing. It was insane because she was so young and then came around collecting money. The children are worse than the adults, but then maybe their parents were encouraging that sort of behaviour. We decided that 1 drink each was enough so we took a stroll back to the apartment and got some sleep. After both catching up on sleep, we got ourselves ready to explore Nha Trang. We walked for around 45 minutes to Po Nagar Cham Towers. These were temples built between the 7th and 12th centuries where people go to worship. This was great to see, and the views from the top were again fantastic. We were walking around and heard music playing, after investigating we came across people singing and dancing. The most random things happen in the strangest places, but that’s all part of travelling and we love that! After exploring the towers, we decided that we would visit the Alexandre Yersin Museum, where he was the discoverer of the bacillus responsible for the bubonic plague. We didn’t have high hopes for this but gave it a go anyway, and it turned out to be really interesting, so if you visit Nha Trang and are interested in History then definitely check this out. There isn’t a huge amount to do in Nha Trang and most attractions are quite far out and hard to get to as there is no public transport. We headed back to a café and focused on the blog for a little while and then back to the hotel to recharge our batteries ready for our evening. After getting ready we headed out for some dinner and then went back to the hotel as we were both so tired. The following day as there wasn’t a lot to do, we relaxed on the beach after haggling to get prices down for the sunbeds and got talking to a lovely Canadian couple. We were talking to them for ages, so long we didn’t realise the sun had moved round and was, in fact, cooking us. They seemed like great company and we arranged to meet them that evening for some drinks. Until then, we sat talking to them and then headed off for some lunch and back to our regular cafe to do some blogging. We went for some Western dinner as we were craving familiar food, it was disappointing and didn’t taste ‘familiar’. Spaghetti Bolognese which didn’t taste like our parent’s versions (which we miss… ALOT). We met up with our new pals, played some pool and had some drinks. It was a great evening with great company. The next day, again we didn’t get up too much but we did discover a shopping centre with an actual supermarket! Supermarkets are very rare in Vietnam so this was a pleasant surprise. We wandered around and discovered the most atrocious items of clothing. We grabbed some food for lunch, sat on a bench and enjoyed our picnic whilst overlooking the sea. Later, we sat in another coffee shop and focused on blogging before going back to the hotel. That evening we went out for dinner and came across a restaurant where we could sit on the 1st floor and overlook the street. We ordered foot-long sandwiches which were delicious, and very cheap. The restaurant was called Gecko, so if you love a foot-long then check it out. We headed back to the hotel, packed and got ready for our early morning the following day ready for the next destination. Whilst getting onto the sleeper bus we got talking to another couple from the Czech Republic. They seemed like a great laugh and they said about sitting at the back of the bus with them because there were 5 seats and one of those seats we can put all our belongings on. This seemed like a good idea at the time until the bus was full and someone required our ‘spare’ seat. There we were laying there like awkward sardines with the heat from the engine blasting away – we were now sweaty sardines. Everyone looked cosy and comfortable and we were stupid yet again and made the wrong decision, but oh well, only 11 hours to go I suppose. When we got onto the bus, the first thing I checked for was a toilet – which turns out it didn’t exist. No toilet on an 11-hour journey, you have got to be joking! For anyone who knows us personally, we don’t have strong bladders and when we need to go there is no waiting, we seriously NEED to go. 45 minutes into the journey and guess what we needed? Yep, the toilet…already. James went and asked the angry bus driver and he said 30 minutes until he stops. 15 minutes later he stopped, a handful of guys get up and off they go to pee on the side of the road. However, this is no place for ladies to go to the toilet, as I was pushed away by the arrogant driver, that was when I thought I was going to lose all my dignity I ever owned and pee in a bottle.